A cab driver lost his life after a van crashed into his vehicle in downtown Nashville. The NashVegas taxi van driver was rear-ended at the intersection of Second Avenue South and Peabody Street by a Ford Econoline van. In addition to the cab driver losing his life, a passenger inside the taxi and two people in the Ford van suffered injuries and had to be transported to a local hospital, according to The Tennessean. Deepest condolences go out to the family and friends of the cab driver. Losing a loved one is always heartbreaking, but it is especially awful when the loss is sudden and caused by the careless actions of another. If you lost a loved one in a preventable accident, you are probably emotionally devastated and angry. You want some semblance of justice for your loved one. This is why it makes sense to consider filing a wrongful death lawsuit. This is a civil claim intended to restore you and your family to a place financially that would have been realistic had your loved one not died. Under Tennessee law, negligence is defined as someone who fails to exercise reasonable care and their careless or reckless actions results in the injury or death of another. For example, if a motorist fails to apply their brakes at an appropriate time and rear ends another vehicle, the motorist has breached a duty of care to operate their vehicles in a reasonably safe manner. In Tennessee, only the decedent’s spouse, child or parent has the ability to file a wrongful death lawsuit. If the decedent was not survived by a spouse, child, or parent, then someone who is eligible to inherit the decedent’s estate may petition a court to be appointed as a representative of the estate and can proceed with filing a lawsuit. The law also requires that only one wrongful death lawsuits be filed. This means if a parent files a wrongful death lawsuit and a child files a lawsuit, a court would likely consolidate those two suits into one to promote judicial efficiency. In Tennessee, you only have a finite amount of time to take legal action against the other driver. 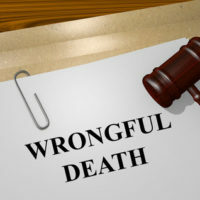 A wrongful death lawsuit must be filed in a civil court within one year starting from the date of your loved one’s death. This is why it is so important to contact an lawyer as soon as possible. The Nashville wrongful death lawyers at Calhoun Law, PLC are ready to help you and your family through this difficult time. We understand the complexities of the wrongful death claims process in Nashville. We have years of experience handling these types of cases and will work tirelessly to get the compensation you are owed. Contact us today for a free, confidential consultation.